Osh is the second-largest city in Kyrgyzstan, after the capital Bishkek. It lies in the south-west part of Kyrgyzstan, along the boring with Uzbekistan, and is sometimes called the 'capital of the south.' Osh is estimated to be over 3000 years old, one of the oldest areas in Central Asia, and legends claim it may have been founded by Solomon or Alexander the Great. Osh, like other cities such as Shymkent and Taraz, was once a stop on the great Silk Road from China to Europe, and Osh was specifically noted for its silk production. Osh remains on important travel routes in the modern day, as it is the end of the Pamir Highway that starts in Afghanistan and winds through Uzbekistan, Tajikistan, and Kyrgyzstan. Suleyman Mountain, the only World Heritage site in Kyrgyzstan, is located in Osh. Originally named Bara Kuch (Nice Mountain), it was renamed because the Muslim prophet Suleyman Sheikh was buried at its base. 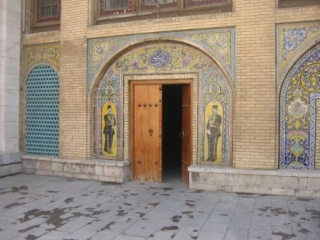 It is now a pilgrimage site and a tourist attraction. The mountain offers an amazing panoramic view of Osh and a cave housing a museum of fascinating historical and natural objects. Travelers can also view a mosque built on the mountain by 14 year old Babur, who was king of the region in the 1400s and went on to found the Moghul dynasty in India. As well as being the capital of the Osh province, Osh is a bustling city full of sights and activity for travelers. Visitors enjoy seeing the monument to Kurmanjan Datka, the so-called "Queen of the South" who ruled part of Kyrgyzstan in the 1800s. Along with the city of Bishkek, Osh showcases one of the rare remaining statues of Lenin from Soviet times in Central Asia. Osh boasts a splendid Russian Orthodox Church and the Shaid Tepa Mosque, the biggest mosque in Kyrgyzstan, as well as a historic mosque dating from the 1500s, Rabat Adbul Khan Mosque. 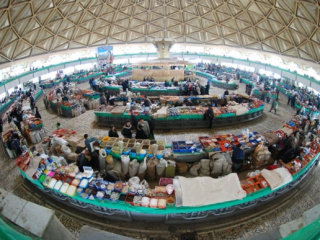 The bazaar in Osh is one of the largest and most picturesque in Central Asia, a wonderful place to watch the locals or to do some shopping along the Syr-Darya River. Osh offers a variety of daytime and nighttime activities for travelers, such as a sports stadium, pools, skiing, movie theaters offering English, Russian, and Indian films, nightclubs and discos, and concert halls.